← Warhawk Book Talks – Oct. 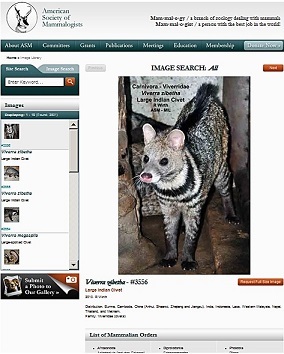 The American Society of Mammalogists hosts a digital mammal image library containing more than 2,500 images. Browse a numbered list for a random delight, select a mammalian order (e.g., Proboscidea) at the bottom of the screen, or search the image library for keywords. Information provided with each image includes location and year of the image, as well as the mammal’s geographic distribution and group, order, family, and genus. Andersen Library can help you learn more about mammals! Search Library tools to find books such as the 6th edition of Walker’s mammals of the world (2nd-floor Reference Collection, QL703 .N69 1999, or earlier editions in 3rd-floor Main Collection), The origin and evolution of mammals (online via ebrary), Mammalogy: Adaptation, diversity, ecology (3rd-floor OVERSIZE, QL703 .M36 2015), and The wild mammals of Wisconsin (3rd-floor Main Collection, QL719.W5 L67 2008). This entry was posted in around the world, info.gov and tagged animals, books, Friday fun, government info, images, mammals, mammology, nature, science, web sites, wisconsin government, zoology. Bookmark the permalink.